As the Arkwright Scholarships Trust was established specifically to promote careers in engineering amongst Year 11 pupils, the Reece Foundation was eager to get involved in encouraging talented young people to explore career opportunities they may not have access to without this help. Named after Sir Richard Arkwright, the “father” of the factory system, Arkwright is the largest and most prestigious Scholarship scheme of its type in the UK so it was a natural fit for the Foundation. The Trust invites high ability 15/16 year old Design and Technology students planning to study Maths and Physics, who have an interest in engineering, to apply for an Arkwright Scholarship as they start their ‘A’ Level / Scottish Highers courses. The Trustees of the Reece Foundation strongly believe that young people from disadvantaged backgrounds, should be encouraged to reach their full potential and with engineering at its heart, they felt the scholarships were an ideal way to support Arkwright in its vision to inspire and nurture future leaders in engineering and design. We receive regular updates from the students progressing through their studies and it is interesting to hear how the advice they receive from their Arkwright mentors is helping them to focus on their career paths. The funding also offers scholars the opportunity to make use of the Headstart project which gives them a taste of life at a University before they make their final decision. The Reece Group has been able to contribute and strengthen the relationship with the Arkwright Scholarship Trust by inviting students along to one of its companies, Pearson Engineering for Engineering Experience days. Senior engineers at PEL hosted the day which began with demonstrations of the company’s new bridge launch and recovery mechanism which has been designed and developed by PEL for the defence sector. 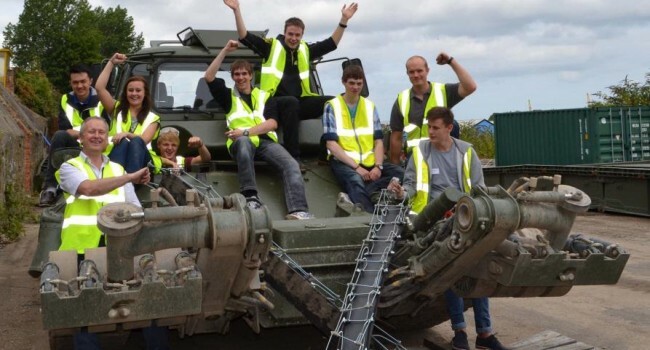 The students were divided into two groups and tasked with building a lightweight military trackway that would allow a quad bike to cross a two metre gap. During the design and building process the students had to analyse supplied data and develop calculation sheets of load bearing and critical buckling and snapping points for various materials. Two different designs resulted and these were pitted against each other with the quad bike riding over them. To the delight and pride of the students both bridges survived, although one did show some stress buckling. Not content with this extreme challenge, it was decided that the bridges merited further and more extreme testing. To the amazement of the students a 40 ton Leopard Tank approached and proceeded to test the student’s endeavours to their very limits. Unsurprisingly, the bridges did not survive and were mangled by the tank. Rick Cronk, Senior Engineer, Pearson Engineering praised the efforts of the students saying, “It is always a pleasure to welcome the Arkwright Scholars to the Pearson Engineering Experience Days and this year the students have excelled both in terms of capability and enthusiasm. Although the bridges failed in the final extreme test, they retained some integrity and this is to the credit of the understanding of the task in hand shown by the students. Georgina Hare, Charity Relations Manager for Arkwright Trust was full of praise for the staff at PEL who had made the day such a success, she said: “This sort of experience is vital for budding engineers. It helps to develop their self confidence and give them actual hand-on experience in a real working environment.